We repair and replace commercial air conditioning systems in and around Virginia Beach, Virginia. Most rooftop air conditioning units are single cabinet units that are capable of providing a large enough capacity for cooling and heating to enable them to handle the larger interior spaces required by many businesses. These commercial HVAC system are designed to provide heating and cooling for entire retail stores, office spaces, or industrial buildings. Some of these systems can also include additional features such as solar panels, high end filtration systems, and humidity control. Rooftop air conditioning units and rooftop heating units usually have a single outdoor compartment that provides the heated or cooled air to each room of a building through a series of ventilation ducts which run under floors, behind walls and in crawlspaces. The heated or cooled air moves through the ducts at one uniform speed, maintaining each room at the temperature preset in the thermostat. 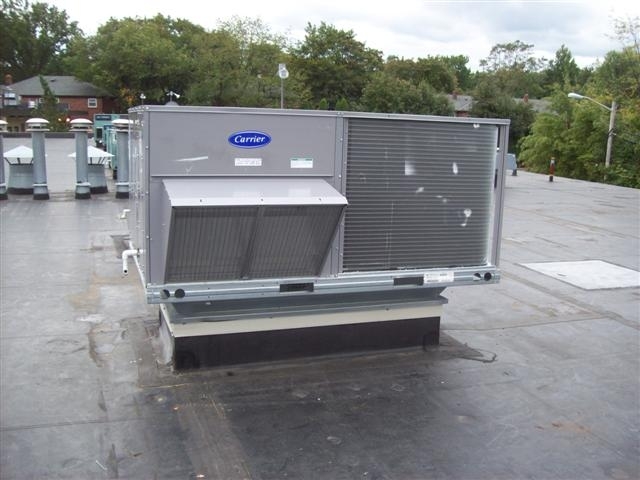 Commercial rooftop HVAC systems are specifically manufactured to be very heavy–duty and dependable while providing the highest level of comfort to employees as well as customers throughout the year during each season, all year long. Typically these systems are installed on the rooftops of used rooftops of retail stores, office buildings, shopping centers, schools, hospitals, and industrial buildings. Commercial rooftop units in Hampton Roads area can also consist of air conditioners and heaters that are used independently but located adjacent to one another, or they can be one single rooftop unit which will provide both heated and cooled air as needed. The placement on the roof provides the benefit of having the HVAC system out of the customers’ sight as well as utilizing otherwise unused space to contain these large bulky units. We provide quality commercial rooftop unit repair service to all of our customers, including rooftop HVAC installation and replacement, as well as rooftop unit repairs and maintenance. We are experienced in commercial rooftop AC repair in addition to residential air conditioner repair services. Our HVAC company works throughout the Hampton Roads are, including the cities of Virginia Beach, Chesapeake, Norfolk, and the surrounding areas.